The pancreas is a glandular organ located close to the liver, the stomach, and the small intestine. It has two main functions, an exocrine function and an endocrine function. Most of the gland produces substances called enzymes to help digestion (the exocrine cells). The pancreatic ducts transport these enzymes into the intestine. The bile duct, which runs from the gall bladder in the liver, is located very close to this duct, so diseases affecting one duct often affect the other. The endocrine cells are located in small groups ('islets') within the pancreas, and produce substances called hormones that have effects in other parts of the body. The hormones include insulin, which is the main hormone regulating sugar levels in the blood. Loss of, or poor functioning, of this hormone causes diabetes mellitus. Another hormone, called gastrin, stimulates the production of acid in the stomach and intestines. What types of pancreatic tumor are there? Tumors in the pancreas are not all cancerous. Pancreatic nodular hyperplasia with multiple nodules is a common finding in old dogs and cats. This condition may sometimes occur as a compensation for previous injury, but usually there is no known cause for pancreatic nodular hyperplasia. "Cancers of the pancreas may arise from the exocrine cells or the endocrine cells." 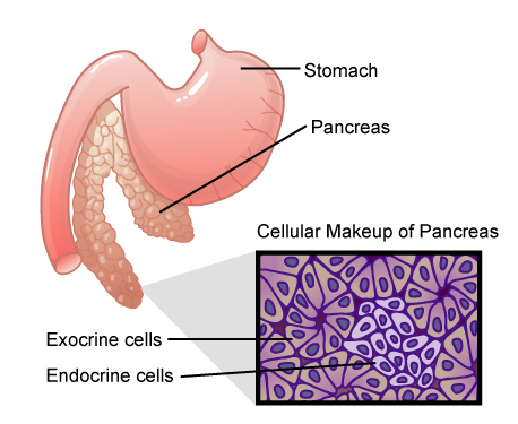 Cancers of the pancreas may arise from the exocrine cells or the endocrine cells. Both groups of tumors may be benign (pancreatic adenomas) or malignant (pancreatic carcinomas). Exocrine pancreatic adenocarcinomas are aggressive and invade the wall of the adjacent gut and rapidly spread (metastasize) to the inside lining of the abdomen (peritoneum) and to the liver and other organs. Endocrine tumors often produce hormones that have effects on other parts of the body. Benign tumors grow slowly and can be surgically removed but some malignant tumors rapidly metastasize to the liver and lymph nodes. Rarely, as in any part of the body, there may be cancers of the fibrous connective tissue, nerves, blood vessels and lymphatics. 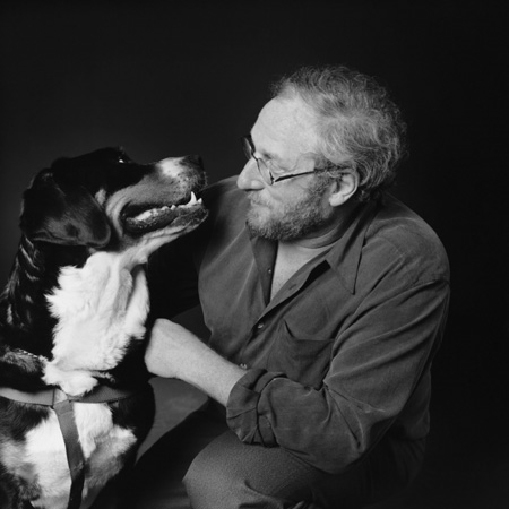 The reason why a particular pet may develop this, or any cancer, is not straightforward. Cancer is often seemingly the culmination of a series of circumstances that come together for the unfortunate individual. Pancreatic nodular hyperplasia sometimes follows injury but is usually without any known cause. We do not know the specific causes of the cancers. "The more divisions a cell undergoes, the more probable is a mutation so cancer is more common in older animals." Pancreatic nodular hyperplasia is a common finding in old dogs and cats. Exocrine cancers are uncommon and benign tumors are rarer than their malignant counterparts. They are more common in dogs than cats. Older animals are more often affected but they can occur in animals as young as three years of age. Endocrine cancers are also uncommon. The most common type is derived from the insulin secreting 'beta cells', and is called an insulinoma. For exocrine lesions, there is a continuum and progression from hyperplasia to malignancy. Pancreatic nodular hyperplasia does not usually affect pets clinically but if there is scar tissue (fibrosis) and inflammation of the adjacent bile ducts of the liver, signs may include local pain and vomiting. Benign exocrine tumors are often small and are often incidental findings. Malignant exocrine tumors cause abdominal pain, vomiting and weight loss. An abdominal mass can usually be felt. Jaundice is often present due to obstruction of the bile duct. Swelling of the abdomen with fluid (ascites) occurs as a result of compression of veins. Leakage of digestive enzymes will actually digest surrounding tissues and it these tissues die. The course of malignant disease is rapid and these are painful cancers. Endocrine cell tumors usually produce hormones with effects on other parts of the body. The most common type of endocrine tumor is derived from the cells that make insulin (insulinoma), and it causes low blood sugar concentrations. This produces clinical signs such as weakness, confusion, collapse and possibly convulsions and coma. A hormone called 'gastrin', which increases the acid in the stomach and intestine to cause ulcers, is produced by another type of endocrine tumor (gastrinoma). There is loss of appetite, vomiting with blood, intermittent diarrhea and progressive weight loss. Glucagonomas produce glucagon, which induces high blood glucose and damages the liver. With a glucagonoma, the patient usually has concurrent diabetes mellitus. These endocrine tumors can also produce other abnormal hormones, which may cause a 'paraneoplastic syndrome' of hair loss or a specific inflammatory and degenerative condition of the skin known as 'metabolic epidermal necrolysis' or 'hepatocutaneous syndrome'. Sometimes, your veterinarian may be able to palpate (feel) an enlarged mass in the area of the pancreas. Malignant cancers may be palpable through the abdominal wall, but usually the examiner is unable to determine what organ is involved. 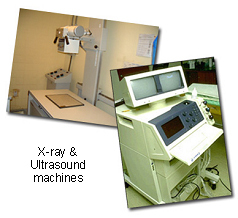 X-rays and ultrasound examination may show enlargements of the organ or changes in the tissues surrounding the pancreas; unfortunately these non-invasive techniques are incapable of distinguishing nodular hyperplasia from true cancers. Blood tests often suggest disease affecting the pancreas, but no blood test is specific for exocrine cancer. Endocrine cancers induce such varied clinical signs that they can be challenging to diagnose. Blood tests can be a good indication of insulinoma but are not specific for this problem. The multiple ulcerations of the stomach and intestine induced by gastrinomas can sometimes be seen on X-rays and there is a special blood test for the hormone. "Ultimately, in all cases, diagnosis relies on opening the abdomen to see the tumors and take tissue biopsies." Ultimately, in all cases, diagnosis relies on opening the abdomen to see the tumors and take tissue biopsies for microscopic examination. These biopsy samples will be submitted to a veterinary pathologist for evaluation using an examination technique called histopathology. If there is inflammation of the pancreas or adjacent bile ducts of the liver, antibiotics or anti-inflammatory drugs may be helpful. Special diets and medication to replace digestive enzymes may also help. There is no satisfactory treatment to treat cancer of the exocrine pancreas. Diagnosis is usually too late for successful surgery and chemotherapy is usually contra-indicated because the cancers are too painful. Benign endocrine cancers can be removed surgically but multiple or malignant ones are not surgically treatable. Medical therapy to control blood sugar is indicated for insulinomas and protective therapy for the stomach and intestine will help patients with gastrinomas. After surgery, the surgical site needs to be kept clean and your pet should not be allowed to interfere with it. Any loss of sutures or significant swelling or bleeding should be reported to your veterinarian. You may be asked to check that your pet can pass urine and feces or to give treatment to aid this. Your pet may require a special diet or medical supplements to aid digestion. The histopathology report will give your veterinarian a diagnosis that often helps to indicate how it is likely to behave. The veterinary pathologist usually adds a prognosis that describes the probability of local recurrence or metastasis (distant spread). 'Cured' has to be a guarded term in dealing with any cancer. However, pancreatic nodular hyperplasia does not usually affect pets clinically. If there is accompanying inflammation of the liver, there may be some ongoing clinical malaise. "The pathologist may not always be able to distinguish between a benign and malignant tumor based on the histopathology sample." The pathologist may not always be able to distinguish between a benign and malignant tumor based on the histopathology sample. In humans, pathologists recognize the continuum from benign to malignant pancreatic exocrine cancers, and may describe them using terms such as "transitional" or "of uncertain malignant potential". Malignant tumors will invade the gut, spread on the inside lining of the abdomen (peritoneum) and metastasize to the liver and other organs. The combination of rapid local growth, early metastasis and side effects of enzyme release makes these tumors aggressive and painful cancers. The course of disease is rapid and incurable. Endocrine tumors are difficult to predict behaviorally on the basis of their histopathology. Benign tumors can be surgically removed but there are often small tumors in other parts of the pancreas. After removal of part of the pancreas, one study showed that the mean time to recurrence of clinical signs was 12 months (ranging from 4-16 months). Mean survival was 15 months. Tumors growing more rapidly tended to have a worse prognosis but this was not statistically significant. Regrowth or spread of tumors to the lymph nodes (glands) and liver may be indicated by return of clinical signs associated with the tumors. Some are highly malignant.